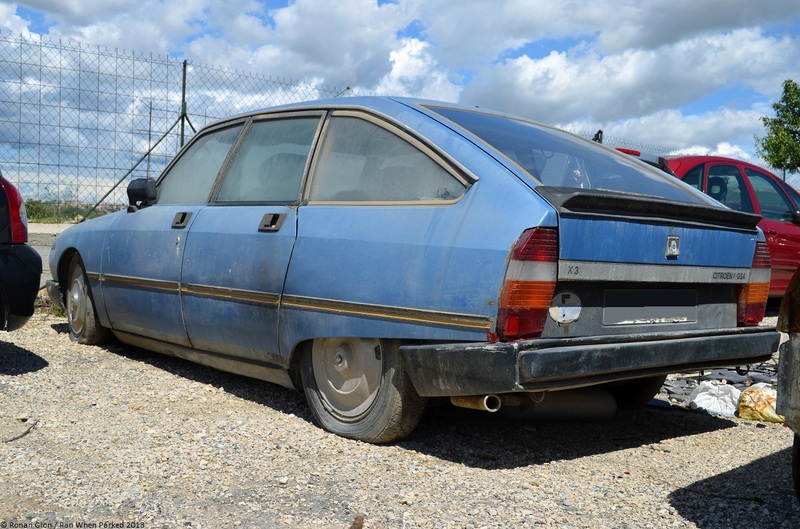 We photographed this 1979 Citroën GSA X3 in the back lot of a local repair shop. Its exact story is a bit of a mystery but the shop’s owner told us that it sat in the back corner of a hangar for over a decade and towed out at the last minute before the building was torn down. Being stored out of the elements, the car is not as rusty as you would expect but it’s taken a turn for the worst nonetheless by becoming its own ecosystem. A close look inside, outside and in the engine bay reveals that miscellaneous rodents, spiders, and at least two different types of wasps (judging from the two distinctly different types of nests) call this mid-size family hatchback a home. The spiders and the wasps are relatively calm tenants, but the rodents seem to have a voracious appetite for fabric and electrical wires. The late-1979 build date is given away by the registration number, and it indicates that this was one of the very first GSA X3s to roll off the assembly line. It is powered by a 1.3-liter air-cooled flat-four that sends 65 horsepower and 72 lb-ft. of torque to the front wheels via a five-speed manual transmission, making it the most powerful – and fastest – member of the GSA lineup during the early 1980s.